BAY NEWS : The shelter in the bay has been repainted and looks splendid ready for the summer. The steps on the path between the Bay and Blackbridge Road have had temporary repairs. The railings at the Bay will be replaced by the IoW Council, but we need someone to paint them. The toilets at the Bay are due for replacement. We meet at 10am armed with gloves and bags to do our bit to keep the Bay clean. The weather once again held up and many keen visitors enjoyed a range of gardens, and raised money for the West Wight sports and community centre . Carol singing in the thatch church once again started Christmas in the Bay, with the Bay Wailers leading the singing and providing beautiful examples of choral festive song , we enjoyed carols,mince pies and mulled wine. The Beach Party was once again a jolly good event , good weather and a goodly crowd enjoyed the food and music. Sam showed what a skilled player he is then the Bay Wailers took on the ocean swell and managed to make themselves heard to great effect! and raised over twelve hundred pounds for the Air Ambulance. click for more pictures from open gardens. Another successful evening of home-grown entertainment raised £100 for the village library. 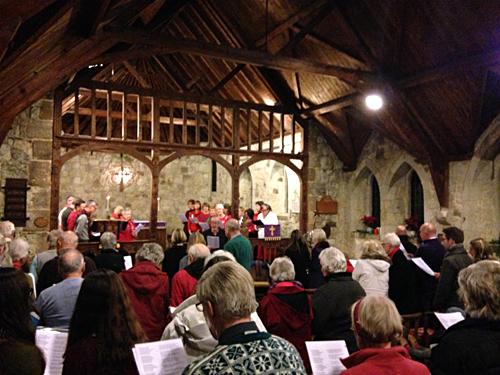 The year was rounded off with our traditional carol singing in the thatched church of St Agnes'. Voices fortified by mulled wine and mincepies. by John Ferguson and now Terry Butchers has agreed to take over responsibility. The original plants are very old and, as new roses cannot be planted in their place, drought tolerant grasses and plants have been substituted. The work was carried out by a very small group of volunteers and the plants bought by FBRA, along with some donated plants. and good live music again by the Bay Wailers and the excellent Sam Scadgell. Proceeds were donated to the independent Lifeboat. The open gardens this year had excellent publicity in the County Press and the best weather of the year so far. raised for the Admiral Nurses (palliative care) and for FBRA projects. cleared the grass area of pebbles thown up by winter storms. how to maintain the area following recent storms and adverse weather. At the quarterly meeting we heard about Timebanking. Here is a brief look at how it works. 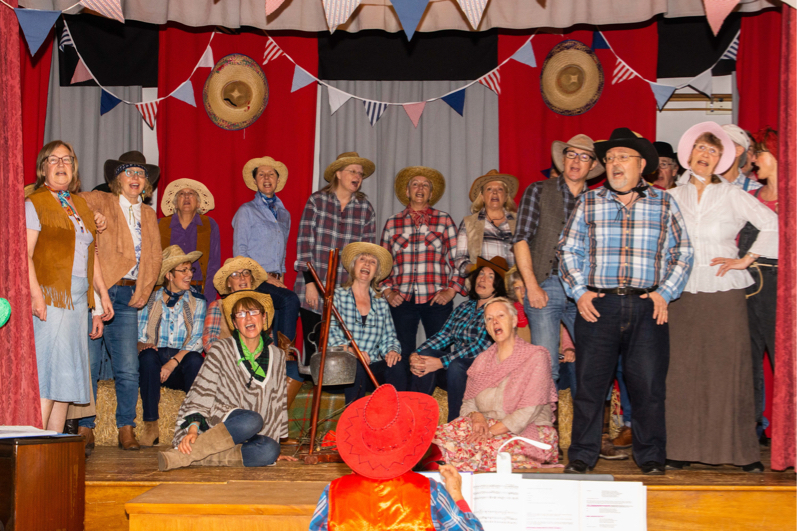 performed by local talent at the United Reform Church Hall. The event raised over £400.00 for FBRA Projects. and which stands beside the door of the thatched church was removed by someone on Sunday night. The cable for the lights was cut and thus were rendered useless. and a new set of lights were aquired at a discounted price. Alec and Sue Alexander did the honours again and the new tree is now in place and looking splendid. Goodwill outshines the pathetic deed. Thanks to all concerned . Our annual bulb planting took place at last having been delayed by bad weather etc. when we will discover who planted them the right way up ! Music by the very talented Sam Scadgell plus a surprise performance by the Bay Wailers. We were pleased to make a suitable donation to our independent Lifeboat. two new ones and four which we have seen develop over the years. The weather was unkind but visitors were undetered and kind in their comments. Coastwatch at the Needles and Kingfisher swimming club each share in the £500 raised. The association paid for a new bench which the National Trust made and installed on Tennyson Down. and the view from it is stunning. we managed to make the rafters ring with our carolling. Sandy led on violin, Judy added descants and growlers added depth to the joyful music. Little Sam performed a mime version of Away in a manger winning warm applause. of cowering in the winter's cruel chill. Our thanks and the collection go to them. and plant around 400 bulbs to brighten up part of our Bay. let's hope their efforts are appreciated next spring. of food drink and good music by the sea...a highlight of the summer! A JOLLY GOOD BASH ! * a good time was had ! which was split between the Lifeboat and the FBRA project fund. Well the wind blew the rain came at intervals and the sea crashed noisily as we gathered at the lifeboat station for our annual Carol singing event. Many brave souls ventured out and enjoyed a rousing start to the festive season helped by the mulled wine and mincepies. Musical accompaniment was provided by a talented crew on a diverse range of instruments, blown bowed and squeezed to great effect. The money raised by the event goes to the Freshwater Bay Independent lifeboat along with our thanks for letting us shelter inside ! This year the bulb planting took place along Afton Road. Each year willing volunteers brave the cold to plant a sackful of bulbs in a location around the bay. The results of these efforts are to be seen in the spring when a mass of blooms erupt around the former Post Office, the corner of Victoria Road and the Bay car park to mention just a few. The committee managed at last to arrange a glorious warm summer evening, and live music by talented musicians, good company, even games for the kids...Well done! Once again we had splendid weather for the annual Open Gardens event. A most satisfactory number of visitors came and enjoyed the various venues, drinks and confections. Over a thousand pounds were raised and a large proportion was donated to the Wessex cancer trust. Many thanks to all involved. After more years than most of us can remember, the Thornton family have sold the shop which stands high on Gate Road. First run by Amy and later by David with some help from John and from the third generation, the shop was a unique mix of stationers, newsagents, art gallery and antique furniture, book and record store, as well as hosting the Post Office and being a general meeting point for the community. David leaves the Island to be nearer his family but John will stay around and continue his work with the lifeboat. Happily the Post Office will reopen when building work is completed and the shop emerges in it's new role as cafe and art gallery in the care of the Scadgell family. To commemorate their years of service to the area the Residents' Association commissioned a bench, inscribed and situated close by the shop. In a separate ceremony the Association presented David with a painting of the view from the shop by local artist Barry Ecuyer. David ,Tom and John savour the new bench. Once again Kelly produced an entertainment of quality and variety. A packed house enjoyed song, dance, monologue and sketches along with singsong, tea and cakes. What more could one wish for on a rainy Saturday night with only England's rugby defeat on tv? Well done to all involved, be they on stage, backstage or in the kitchen. A small group planted bulbs in the grass area on Simmonds Corner of Victoria Road. Many thanks to those who helped to penetrate the 'interesting' ground! On a slightly warmer day another planting session, this time the landscaped area behind the promenade shelter. Last years planting was not successful but after replenishing the soil, and with a better selection of plants we did it ourselves and are hoping for a better outcome. Many thanks to all who helped and special thanks to Judith Hunt who donated replacements for the plants which disappeared overnight! Despite the lure of the Olympics on television a good crowd turned up to share a very pleasant sunny evening in the bay. An array of barbeques heated veggie burgers, locally grown sausages and burgers, cauldrons of onions and to encompass the goodies, a mountain of the village baker's finest bread rolls. Live music was tastefully provided by one of the Island's gifted singer/guitarists, Sam Scadgell. A bonfire on the beach kept the chill off as heavy clouds gathered at the end of a wonderful day. Thanks to those who worked so hard to make it run so smoothly . Once again a number of local gardens were open to visitors. Last year's record number of visitors was beaten, and last year's abysmal weather was not repeated, in fact it was a lovely day and vast quantities of tea and cakes were enjoyed by our visitors. The efforts of all participating were much appreciated and the sum raised for the Samaritans was a thousand pounds. FBRA were involved in the organisation of festivities. Click for pictures and video report. Thank you to the 50 or so folk who braved the bleak midwinter to join in the carol singing at the Lifeboat station. Mince pies and hot mulled wine helped to fight the cold and raise the spirits. Special thanks to the musicians who bravely put lips to freezing instruments and gave a solid backing to our singing. Christmas in the Bay starts with our Carol singing! We turned up and planted the landscape feature behind the shelter in the Bay, and very splendid it looks. The information board describing the flora and fauna of the Bay area was also completed. A grand opening for both features took place amid the high wind and breaking waves we usually get for such occasions! Well it didn't rain! Perhaps not as warm as an English summer evening could have been, but a good crowd turned up to enjoy the food, the music and good company. Many thanks to those who worked so hard to make it happen and to all who turned up to support us. We were able to make a donation of £150 to the Freshwater Independent Lifeboat. The Open Gardens event was on June 5th this summer. Seven gardens both large and small were open and after months of dry weather the gardeners had laboured against he odds for horticultural perfection. The long awaited rain came just as the gardens opened. Happily the great British public turned up, driving in from the far corners of the Island to enjoy the gardens, the company and the cakes. Thank you to our visitors and to the County Press for the great write-up and most of all, to the gardeners. The trip to Goodwood House was another successful outing, the weather was wonderfull and the guided tour was impressive. Christmas Carols at the snow covered thatched church because the lifeboat station is being demolished. The night was bitterly cold and earth stood hard as iron. But still an encouragingly substantial number of hardy souls made it despite the perilous conditions. With the enthusiastic support of the wind band we sang carols then enjoyed mince pies and mulled wine. Thanks to the committee members who made it happen. Although we missed the crashing of waves in the background it was good to have the shelter of the church on such a bitter night. Thanks to David Ballard whose photos were used in making the composite drawing. Despite a cloudy afternoon we had a glorious evening for our Barbeque, good food, good music and good company! This one made up for the past few years of storm and tempest! Thanks to all who made it happen and to those who came to support them..
Our first concert demonstrated the great wealth of talent residing in the Bay area. A most entertaining evening was enjoyed by an appreciative and enthusiastic audience. Congratulations to all who answered Kelly's call! Above; a few of those involved caught in the act. The trip to Windsor was a success, the coach was filled and agood time was had by all. The Beach BBQ followed the Freshwater Lifeboat Open Day and was a great sucess, despite the weather, raising £65 as donation to the Lifeboat. The official unveiling of the shelter Mosaic took place and the pictures are available by clicking the button.